Leifeng Tower is also known as Leifeng Pagoda located at Hangzhou city on Sunset Hill, south of West Lake in the Zhenjiang Province, People's Republic of China. This tower was built in AD 975 and it collapsed in 1924.The tower was rebuilt in 2002, by recreating in the old architectural marvel and today is one of the most busy tourist destinations in Hangzhou city. The tower was built during King Qian Chu of Five Dynasties and Ten Kingdoms to celebrate the birth of his son in one of his concubines, namely Huangfei. 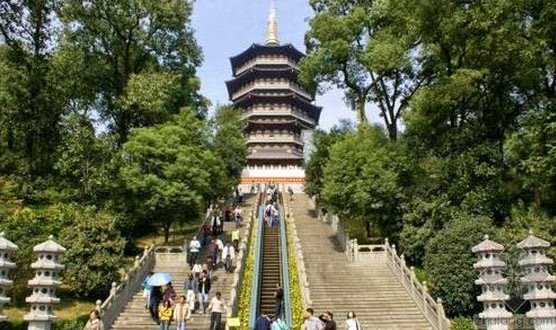 The tower was called as Huangfei Pagoda at that time. The elevation of the tower is in octagonal shape with five storey structure.Brick and woods are used for the construction and the base of the structure is built with solid hard bricks. The tower was attacked by Japanese pirates during Ming dynasty, suspecting that the tower would be storage of weapons and they torched it and bring down the structure in to a brick skeleton.This is evident in some of the painting relics of Ming period. Leifeng Tower is one of the ten most important sights of West Lake and there is a beautiful legend about a white snake related to Leifeng Tower and is known as Legend of the White Snake.People believed that the Pagoda has miracle power and it can protect ladies from miscarriages and repel illness.As a result, people started collecting the bricks and on September 25, 1924 the pagoda collapsed due poor management and lack of maintenance. Legend of the White Snake is a love story between a young scholar who fell in love with a beautiful woman.The woman was actually an impersonated white snake and without knowing the fact, the scholar was emotionally attached to the woman. Seeing this, a monk intervened in their relationship and pushed the snake in to the deep well at the Lei Feng Pagoda and saved the soul of the scholar. Over a period of time the story on hearsay, gradually turned from a horror story to a beautiful love story. The pairs were deeply in love but such relationship is forbidden by the laws of Heaven! The legend travelled through centuries and many art forms and opera took this romantic theme for their cultural shows. There were rumors about a mausoleum lay in the ground of floor of the tower.It was a hot subject of discussion on various historical platforms. Then the authorities decided to conduct a scientific search in the subject with radar mapping. In March 11, 2001 they found the position of the mausoleum and excavated the area. Lot of historical relicts and artifacts were recovered from the mausoleum and surrounding areas. The most important finding was a gold and silver coated hair of Buddha. The Pagoda was decided to rebuilt in October 1999 and construction work started on the same location of the collapsed Pagoda over its ruins.For the construction, 1400 tons of steel and 200 ton of copper is used. The new tower has four sightseeing elevators and equipped with modern facilities such as air conditioners, loud speakers and televisions.The tower is fitted with two automatic elevators which can carry tourists from the base to the top of the tower.All the relics what has been recovered from the mausoleum are kept in a chamber in the underground base.The new tower is declared opened to the public on 25 October, 2002.